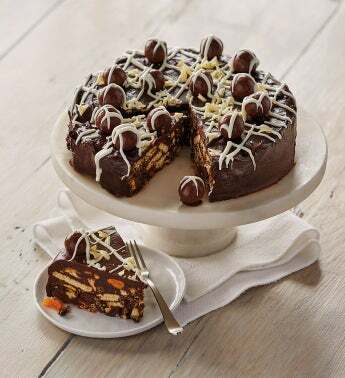 Impress your guests during dessert or afternoon tea with this regal chocolate biscuit cake, crafted in our own bakery using a special recipe from The Royal Touch. We craft it all with apricots, figs, pistachios, and English biscuits enrobed in a rich and luxurious combination of our premium chocolate with butter and honey. The biscuits add a wonderful crunchy texture to this cake, making it a truly unique treat. The cake is covered in a generous a layer of dark chocolate ganache and topped with milk chocolate malt balls and white chocolate curls and is drizzled with white ganache.